We did not reinvent the light bulb here. Raw milk products are exactly that - milk that is unprocessed, whole and living, with all its probiotic bacteria intact. We produce the most delicious natural dairy products and meticulously prepare them for your family to enjoy. Raw milk from grass grazed cows is the most natural way dairy products can be produced. With a lot of extra love and care, we offer the finest dairy products on the market. We are deeply committed to the safe production of high-quality raw milk. Our business utilises industry standard testing-technologies to provide extremely low risk, safe, and healthy raw milk. We achieve our high standards using a team approach, ensuring all risk elements are addressed from our grass to your glass. "if I came back as a cow, I would love being on this farm!" Water on our farm is never used just for a single purpose. Everyone of our operations recycle water used directly back into our soil, which reduces the use of fresh water for pasture irrigation. We believe that the use of water is a natural resource that can be recycled. Gravity is another important member on our dairy farm, as it starts the flow of water or milk whenever needed. We designed our dairy sheds to utilise gravity, allowing us to work smarter in our operations. 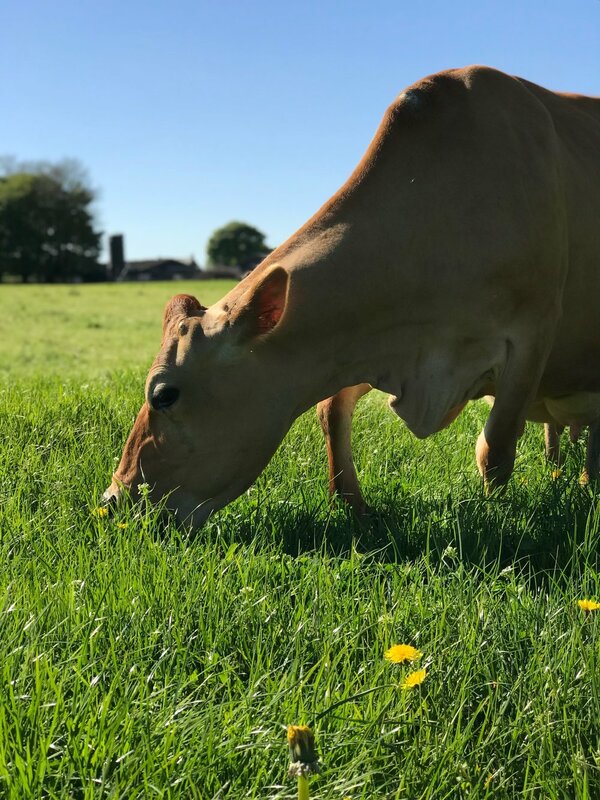 Our number 1 main priority is the happiness and health of our Jersey herd. Our staff is dedicated to continuously improving the lives of the herd and maintaining their comfort and health. Our hard working team has become very skilful at re-purposing and giving metal, wood, or other farm material a new purpose. Our family is honoured to live in such a beautiful part of the world here in the Peak District. We work to create a harmonious balance with our land. The proven health benefits found in whole raw milk are far from any “Milk alternative”, Naturally! Nothing is added to enhance or stabilise this life giving wonder food! Enjoy all of our products without any “intolerance” or milk sensitivities. Our milk is easily digestible, 100% bioavailable, not destroyed or changed during intense processing. People who cannot drink processed, homogenised or pasteurised milk can often easily digest Tagg Lane Dairy’s Raw Jersey milk. Give our milk a try and see for yourselves.